Explore the sustainable gardening practices at work in the University of California Cooperative Extension (UCCE) Demonstration Landscapes - including rainwater harvesting, low-water plantings, more efficient irrigation, composting, mulching and environmentally friendly pest control alternatives. Docent-led tours will be offered throughout this event. Kids – check out the youth garden for games and activities and be sure to stop by for a picture at the Urban Chicken booth or do a craft and meet some furry friends at the 4-H Youth Development Program booth. View a demonstration on butterflies, garden tool care, self-watering containers, or food preservation. Get answers to your landscape questions from University of California experts, UC Cooperative Extension Master Gardeners of Orange County, various industry exhibitors and local water agencies. The ever popular “Doctors Are In” will be available throughout this event to answer any of your landscape, irrigation, and pest management questions. Grab a burger or hot dog, maybe a fresh-made doughnut or snow cone, in support of the 4-H Teen Council. Succulents and other plants available for sale – cash or checks only. 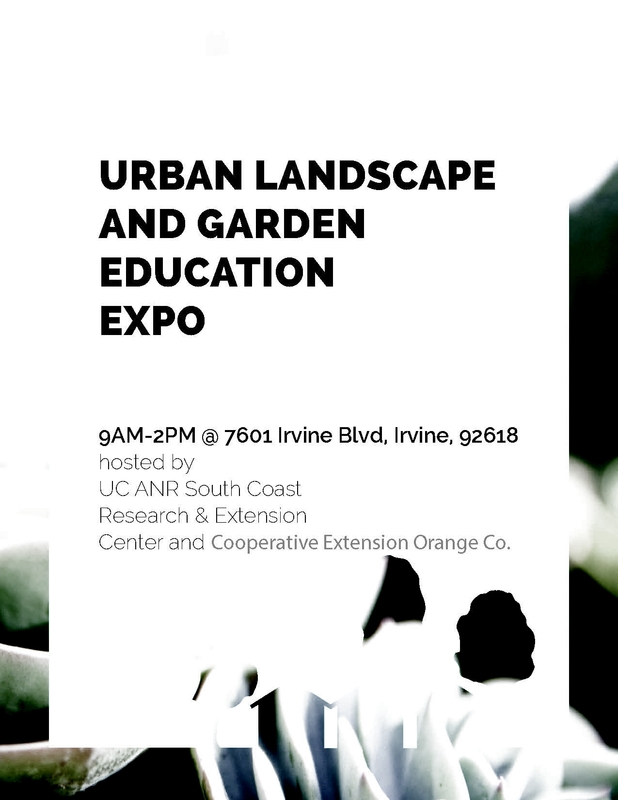 This is a FREE event hosted by University of California ANR South Coast Research & Extension Center, Cooperative Extension – Orange County, with support from Metropolitan Water District of Southern California, Irvine Ranch Water District, Mountain States Wholesale Nursery, Elevations, Filtrexx, and County of Orange Public Education Stormwater Program.